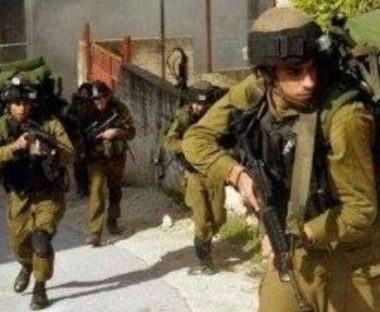 Israeli soldiers invaded, on Thursday at dawn, several areas in the northern West Bank governorate of Jenin, broke into and ransacked many homes, and abducted five young Palestinian men, the Jenin office of the Palestinian Prisoners’ Society (PPS) has reported. The PPS said many army jeeps invaded Ya’bad town, west of Jenin, searched several homes and abducted Rabea’ Luay Hamarsha, Yacoub Yousef Abu Bakr and Firas Hamza Herzallah. It added that the soldiers also searched homes in Kafr Dan village, west of Jenin, before abducting Mohammad Ibrahim ‘Aabed and Mohammad Marwan Mer’ey, from their homes. The soldiers also invaded the home of Mohammad Mer’ey, and interrogated him and his family while searching their property. It is worth mentioning that Jenin office of the PPS has reported that the soldiers abducted 33 Palestinians, including five patients, this month in Jenin. In addition, dozens of soldiers invaded the Deheishe refugee camp, south of the West Bank city of Bethlehem, injured five Palestinians and abducted one. In related news, the Hebron office of the Palestinian Prisoners Society (PPS), in the southern part of the occupied West Bank, has reported that Israeli soldiers abducted, on Thursday at dawn, at least eight Palestinians in the governorate. On Wednesday at night, the soldiers abducted a former political prisoner, identified as Haitham al-Jo’ba, in front of one of the gates of the Al-Aqsa Mosque, in occupied Jerusalem.